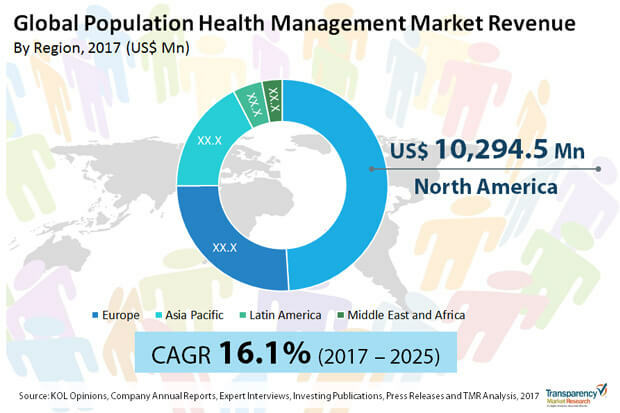 A new report published in the Transparency Market Research demonstrate that the global population health management market likely to witness stellar growth in the near future. The manufacturers operating in the global population health management market are likely to be engaged in mergers and acquisitions in order to expand their footprint across the globe. Allscripts has recently acquired CarePort, with the aim to expand their position in the acute care segment. Several companies are majorly focused towards the research and development process in order to expand their product portfolio and to boost market competition. Some of the major companies operating in global population health management market are International Business Machines Corporation, UnitedHealth Group, Cerner Corporation, Health Catalyst and ZeOmega. The manufacturers are largely focused towards North America region to gain traction in the market. The revenue generated by global population health management market stood at S$ 18,500.0 Mn in 2016 and is likely to touch valuation of US$ 69,000.0 Mn by the end of 2025. The global population health management market is likely to expand at 16.1% CAGR during the course of forecast period from 2017 till 2025. On the basis of component, Service segment account for maximum share revenue in global population health management market in 2016. However, the healthcare provider segment anticipated to account for huge share in the global market due to decrease in per capita expenditure and benefits associated with the PHP tools for instance reduction in care management group. Geographically, North America is likely to account for maximum share in global population health management market. This market is further trailed by Europe. The rate of adoption is high in U.S., Germany and U.K. while compared to other regions. This is due to increasing perception among the population about the profits of the PHM and targeted effort by the non-governmental and governmental organization in order to manage chronic disease. Several healthcare providers have been dealing with various projects to improve health of the general population. With the use of these system, the patient’s clinical information can be accessed, hence, with the use of these system patients can get the access of clinical record without any stretch. Furthermore, surge in the need to manage the healthcare management is stimulating growth of global population health management market. The growing demand of population health models by the accountable care association are another trend supporting growth of global population health management market in foreseeable future. The increasing implementation of patient protection and affordable act in U.S. and increase in trend of big data are another fueling growth of this market during the course of forecast period. On the other hand, high cost involved in installation, dearth of awareness regarding the population health management system are some of the key factors negatively impacting growth of the population health management market. Further, absence of population health management in various developing and developed countries and lack of awareness about the tools are another key trends affecting growth of this market.